In June the protests in Brazil started because of rising fares of public transport tickets to twenty centavos and it has grown to a million demonstrators in the fight against the corruption, economic inequality, poor health and education systems and a low quality of service. In a country which is famous for its fascinating festivals, colorful carnivals and the most professional players in the world, such discontent by citizens did not appear for several decades. Brazilian President Dilma Rousseff even canceled a trip to Japan. This shows that the situation is indeed serious. On June 17th the citizens occupied the streets of the largest city Sao Paulo in Brazil to protest against rising public transport fares and high cost of the organization of the World Cup in 2014. The government had plans to spend 15 billion U.S. dollars on the Confederations Cup and the World Cup. Over 200 000 people protested at least in eleven of the country’s biggest cities, including Sao Paulo, Rio de Janeiro and the capital Brazil. The largest protest crowd gathered in Sao Paulo where 65 thousand people marched through the streets. While the drummers were beating the rhythm, Brazilians were chanting slogans against the corruption. In the capital Brazil the demonstrators broke into the high security area – they climbed on to the roof of the National Congress. In Rio de Janeiro several bloody accidents happened. Although earlier security leaders met with the protest organizers and informed the police not to carry weapons to demonstrations in order to avoid the problems, however, in the city center masked demonstrators set a car of the television SBT on fire, kindled three bonfires and tried to break into the State Assembly building, so the police had to use rubber bullets and tear gas. During the riots over 30 people were wounded. 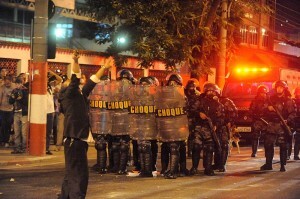 Fierce fighting also took place in Porto Alegre and Belo Horizonte. Television showed the gangs mugging shops in the city center. Most of the businessmen prepared for possible accidents closing the windows entirely. The unrest began when the municipality of Sao Paulo announced that the ticket price of the bus, train and metro will increase twenty centavos. Then other municipalities did that too. Usually in Brazil all fees are determined in January when many other laws are also accepted. It is possible that the citizens reacted sharply because the ticket price changed in the middle of the year. It is strange but protesters’ goal became not only to reduce the cost of transport, but also, after fights with police in Sao Paulo many started to protest against harsh police actions when suppressing the demonstrations. Many people were injured, including several journalists. Since then, the protesters fight against poor health and education systems, high costs of living, increased government funding for sports events, corruption, overbilling in the government and government’s ignorance to citizens’ needs. The protests especially intensified on June 15, on Saturday, whe the Confederations Cup tournament began– a general test event for the World Cup in 2014. While the movement has not selected leader or clear aims, the Brazilian government has already prepared to negotiate with the protesters and the country’s National Congress began to change the laws regarding the requirements of the protesters. Recently, it was confirmed that 75 percent of income from licenses by oilfield operation will be intended for education, and 25 percent for the health care system. The President has initiated several reforms which would lower corruption. However, many speculate that the political parties do not want big changes, and will try to resist the president’s proposals. Brazil is the largest country in South America with almost 200 million people. Although it is the sixth largest economy in the world, as in many Latin American countries, high levels of social inequality are a big problem. Economists from all over the world criticize Brazil’s unbalanced economy – the government failed to stop rising inflation, which raises taxes, for a long time. The protesters are angry because of the significant difference between high fees and poor service quality. Over the last 10-15 years, the middle class in Brazil has increased. Millions of people have become part of the middle class – which means that they have started to get higher income. However, millions who have become part of the middle class now have the losses – because of higher salaries they have to pay more taxes, therefore they begin to understand what government didn’t do for them. The difference between the amount of the fees and service quality becomes more obvious.